Pretty in Pink! Karmin has taken their Hottest Selling Professional Flat Iron and made it available in a Hot shade of pink. Introducing an amazing breakthrough in technology; The Karmin Envy Professional Titanium Flat Iron. This straightening iron takes the amazing feature benefits of ceramic heat, ionic technology and combines them with Titanium for the ultimate Hair Straightening Iron. Won't damage hair like other straighteners. Variable temperature settings for all hair types. The maxium temperature is 200"C (410"F) , and the minium temperature is 80"C (176"F). Tangle-free 3 meter, 360" swivel cord. For the past year I have been using a ceramic hair iron, so the moment I received these Karmin's Titanium I had to try one to see if it could possibly get any better. I was blown away with just the look of these irons, the plates are like glass, extremely smooth and glossy. As usual the iron heated up within seconds and was ready to be tested. Now, yes I am the seller and of course sales are important to me, I have bills to pay, but customer service has and will always be top priority for me. I can tell you this, YOU WILL NOT BE DISSAPOINTED WITH THIS FLAT IRON!! Now, I have frizzy hair, down to the middle of my back and although my hair is pretty healthy I do have damage from wearing in it in a pony tail. I have this one section of hair that is hard to tame because of split ends and damage from hair elastics. Well after using this iron you would never know, my hair is smooth and shiny and best of all there is NO frizz and NO static! My hair colour is also more resilient and I don't even colour my hair! I'm in love and I know you will be too, it is definatley the best hair straightener out there and trust me, I have tried many different brands, after all, it's my job! Titanium is a lustrous metallic element found in igneous rocks and know for its strength, durability, light weight and high temperature stability. Titanium offers many features and benefits in a hair styling tool. Titanium provides amazing durability under high heats and offers an even heat distribution. Scratch resistant and extremely durable Titanium is a great benefit for a hair iron that will last you many years. When combined with ceramic, negative ions and tourmaline, Titanium works to enhance your hairs hydration and shine. Eliminate frizz, enhance shine, and improve the overall look of you hair. Your hair is left hydrated, soft and healthier. NO! Traditional ceramic irons rely on heat alone which risks damage to the hair. Karmin relies on ionic and infrared juices, which provides a better, healthier method. More Fabulous Results - NOW Without the Risk of Damage! Karmin High Performance Irons give shinier, silkier, smoother and healthier hair than other ceramic irons. Negative ions close the cuticle layer to create a smooth, silky hair surface and seal in the hair--- natural moisture. This provides ultimate shine, colour and moisture protection for hair. Negative Irons also eliminate static electricity on the hair surface so hair is left silky and frizz-free! Far Infrared heat penetrates the hair to heat it gently from within. This creates a different type of heat that doesn't heat the hair. Instead, more heat is delivered directly to the hair shaft so hair is suppler and can be worked quickly and easily. Because less heat is delivered to the surface, hair is not damaged. The benefit of negative ions and Far Infrared Tourmaline means that as we're not using high heat alone, there is less risk of damaging the delicate, yet critical cuticle layer. Tourmaline--- enormous amount of negative ions creates more shine, silkiness and smoothness than traditional ceramic iron. 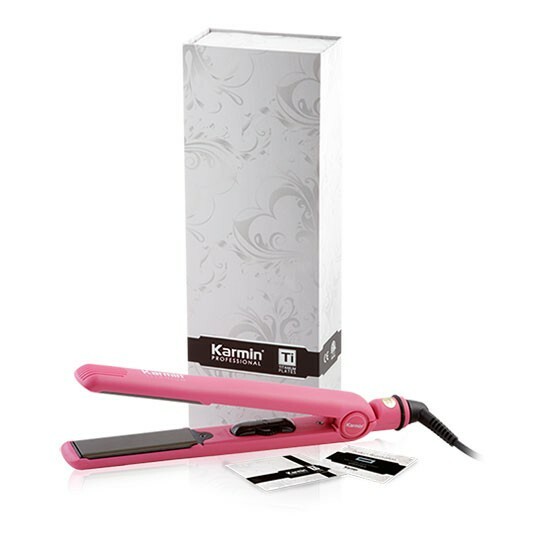 Karmin hair straighteners are Micro-chip controlled providing a constant and even heat. Karmin hair straighteners heat up in less than 10 seconds and whilst most other straighteners are simply ceramic coated, Karmin boasts 100% pure titanium plates that actually protect the hair. Our Karmin straighteners are THE professionals choice and incorporate the latest infra-red and negative ion technology that ensures the hairs natural oils are locked in creating beautiful shine and straightness that lasts. What does it mean to have titanium plates? Flat irons are made using a variety of materials but the most common are ceramic, titanium and a tourmaline ceramic blend. The pure ceramic plates are the lowest quality and generally the least expensive. These kinds of straighteners are sold at discount stores for less than $50.00. Titanium plates are much higher quality and are perfect for every-day use. These kinds of plates are smooth against the hair and lock in moisture as they straighten the hair. In addition, they heat more evenly than glass plates, preventing hot spots on the plates, as well as uneven straightening. Tourmaline and ceramic blended plates are the highest quality available, but are the most expensive style. What is the temperature range of the Karmin Envy Pink Titanium? The Karmin Titanium ranges from 176°F to 410°F (80°C to 200°C). The average person requires a temperature of 375°F to 395°F to achieve the best results, but having an adjustable temperature allows the Karmin Titanium to meet the needs of every hair type and length. 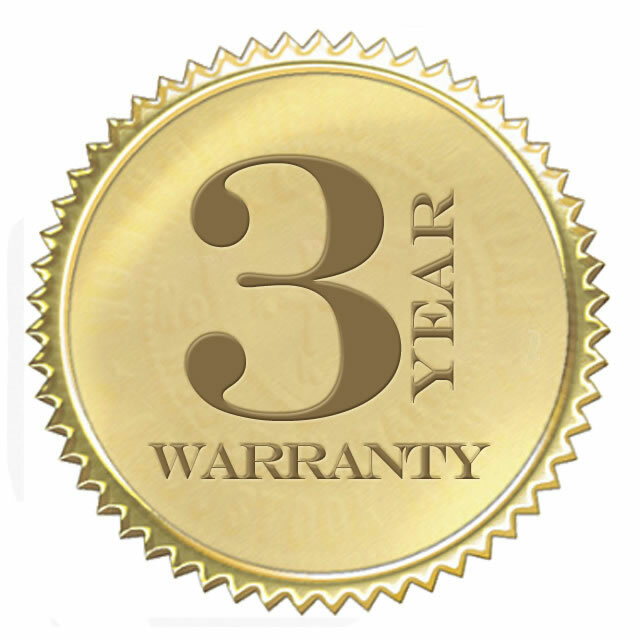 Karmin, the manufacturer, provides a 3-Year Warranty on the Karmin Envy Pink Titanium Hair Straightener. They are guaranteed to be protected from defects due to faulty workmanship or material. A proof of purchase date is required and the guarantee is no longer valid if the damage was caused due to carelessness of the customer or work done by an unauthorized person. Please contact Karmin directly at www.karmin.ca for more information. MyHairStylingTools.com offers a 15-day money back guarantee for all products purchased from the site. If you are in any way unsatisfied with the product, you can return it, guaranteed. Depending on the situation, your return may be subject to a $14.95 restocking fee; please contact a Customer Service representative for more information. How can I clean the plates of my Karmin Envy Pink Titanium? If you use styling products in your hair, it is possible to create build-up on your flat iron plates. To clean it, ensure that the iron is unplugged and completely cooled. Do not attempt to clean your straightener while it is on or hot. Take a clean cloth and gently wipe the plates until the product is removed. You may also use warm water or flat iron cleaning solution for better results. Refrain from using a damp or wet cloth near the cord or electrical plug. What is the difference between the Karmin Titanium and the Karmin Envy Pink Titanium? The primary difference in these two products is the color. This product is black and the other is pink.